We have loved being at the photography show this year! If you haven't made it up yet there are still a few hours left today to come and see us. We have experts on hand to talk about Voigtländer, Photoflex, Quantum & much more. Flaghead Photographic Ltd is pleased to announce that the 2015 Voigtländer Product Catalogue is now available for PDF viewing & download. We will also be taking a limited number of printed editions to the Photography Show at the end of March - Come and see us on stand J31! From the 16th of February to the 30th April 2015 every purchaser of a Voigtländer lens can claim £50 Cash Back from Flaghead Photographic Ltd.
Voigtländer M mount lenses, Micro Four Thirds, DSLR (Nikon/Canon) - Click Here to view the range. 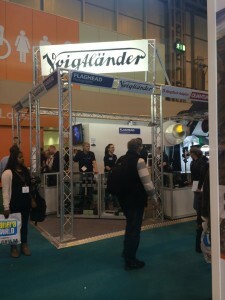 Voigtländer is one of the oldest names in the optics industry, founded in 1756 by Johann C Voigtländer in Vienna, Austria. The company produced the famous Petzval lens, the fastest at the time at F3.7 and in 1841 a metal Daguerrotype camera. An illustrious heritage indeed! Today the tradition continues with a large range of classic, metal construction, manual focus lenses for Leica M mount lenses, Micro Four Thirds, DSLR Nikon & Canon and Sony E mount lenses. 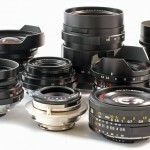 In fact by using various adapters many other cameras (Sony E Mount) are capable of using these high quality lenses. The Ultra Fast Nokton lenses (f0.95) are the fastest growing segment for Micro Four Thirds cameras such as Olympus, Panasonic and video cameras from Blackmagic. To claim the £50 Cashback: Customers simply send a copy of the invoice, with a record of the serial number, of the Voigtländer product to Flaghead Photographic Ltd and a payment will be issued by cheque, PayPal or Bank transfer. Only product purchased from an authorized UK retailer and imported by Flaghead Photographic is eligible. This is a consumer promotion and the cash-back amount includes VAT (if applicable).